If you live on the west coast of North America, stretching from Northern California to Mexico, you might have seen a wild light show on November 7th and November 9th. If you did, have no fear and definitely do not listen to any conspiracy theorists; there were no aliens involved. It was just two separate test launches of the Trident II D5 submarine launched ballistic missile. But really; these are significant events! 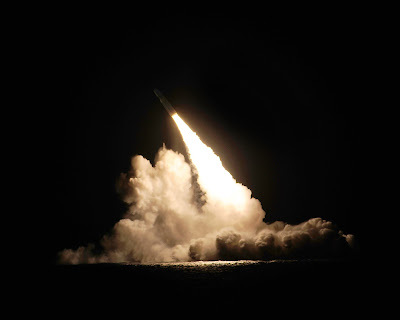 The US Navy launched the two test flights from the OHIO-Class "Trident" ballistic missile submarine (SSBN) USS Kentucky, which was submerged off of Point Mugu, Southern California. The missile traveled from its launch site to the US Ballistic Missile Test Site on Kwajalein Atoll in the Marshall Islands where it very likely plashed down in the precise location intended; it has been said that the multiple independently targetable reentry vehicles carried on the D5 missile can hit a target the size of a baseball diamond with extraordinary accuracy. The Kentucky finished its mid-life overhaul and nuclear refueling in April 2015, and as part of its subsequent shakedown before being pressed back into service its crew conducted the test launches to ensure the proper functioning of its missile launch systems as well as the reliability of the Trident missile itself. The Kentucky is based at Naval Base Kitsap-Bangor, the Navy's West Coast home port for eight of the nation's fourteen Trident submarines. Just one of these Trident submarines, each carrying up to 24 missiles, each missile currently carrying an estimated four warheads on independently targetable reentry vehicles, is capable of incinerating an entire large continent. These two test launches marked the 156th and 157th successful test launches since the missile's initial deployment in 1990. The missiles are manufactured by Lockheed Martin Space Systems in Sunnyvale, California. It is clear that, as Popular Mechanics stated it, the US is definitely "flexing its nuclear muscles" in a clear message to Russia that we've still got the nukes, and we're ready to use them. And Trident is king when it comes to US nukes; currently accounting for roughly 70% of deployed nuclear weapons in the US arsenal. The Navy most likely timed the two Trident test launches with the intention of creating a public spectacle in order to ensure maximum visibility to other nations, particularly Russia. Ironically, the Russians have been keeping tabs on Trident (and other US nuclear weapon systems for some time since the fall of the Berlin Wall). Had the US decreased reliance on Trident, a relic of the Cold War standoff between the US and then Soviet Union, following the end of the Cold War, things might now look much different on the global nuclear front. China has been building up a ballistic missile submarine fleet and the associated weapons. And of course, Russia has started building new SSBNs and is upgrading older SSBNs, and is developing a new submarine-launched ballistic missile (the Bulava). A new Cold War is rapidly growing and heating up. 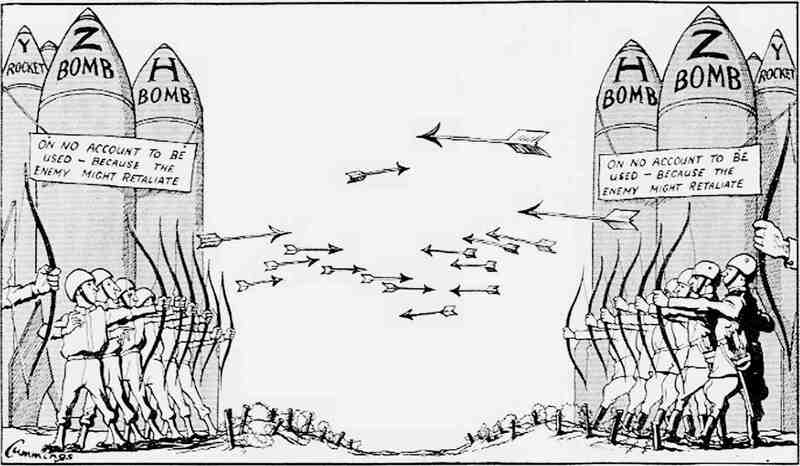 Both the US and Russia have been throwing salvos of nuclear rhetoric at each other, and at this rate it might not be long before it starts looking much like it did back in the day when the two superpowers were locked in the deadly game of Mutually Assured Destruction. Dark days indeed! The irony of all this is that we were handed an extraordinary "peace dividend" with the fall of the Berlin Wall. Had the US ramped back its nuclear weapons deployments back then, taking both land-based missiles and the Trident submarines off alert status, it would have sent a clear message that there was no need to threaten each other with extinction anymore. Yet, in the case of Trident, the US had invested in a new missile, the Trident II D5, which was first deployed in 1990, just prior to the end of the Cold War. Neither the Navy nor Lockheed Martin were keen to mothball the new missiles or the crown jewel of the nation's nuclear triad (the Trident submarine). So Trident quietly continued to deploy, running silent and deep, essentially unnoticed here at home (although not by the Russians nor other nations). And now the US Navy is hard at work, along with its partners in the shipbuilding sector, to develop a successor to the OHIO-Class (New Trident), scheduled to begin construction in 2021 and begin entering service in 2031. 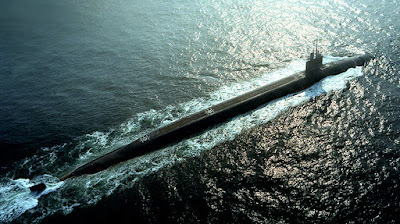 The principal rationale given for the new submarines is the need to maintain the nation's "strategic nuclear deterrent." The principal irony of all this is that nuclear deterrence has failed a number of times (e.g. Cuban Missile Crisis), and it has only been by the miracle of human intervention that the world was saved from what would have certainly been the end of civilization (as we know it). While "experts" have argued for the strategic deterrence doctrine during the strange days of the Cold War, we now live in an even stranger new world in which we have very unstable non-state actors (that might acquire a nuclear weapon) as well as states that quite possibly do not stand the test of "stability" required for deterrence to work. Add to that the fact the probability that leaders of stable nation states might act irrationally under times of great duress, and the argument for deterrence crumbles. Deterrence must be 100% infallible in order to be relied upon, and that is absolutely impossible in the real world. One failure could literally bring about the deaths of billions of people. Trident was designed at the height of the Cold War, with at least one specific purpose - to present a guaranteed second strike capability (the ability to respond to a nuclear attack) to hold the Soviet Union at bay. The design of the Trident missile also presented an unstated purpose - to present a first strike (preemptive surprise attack) capability as well. Trident was only designed to hold the Soviet Union hostage to the inevitability of Mutually Assured Destruction, in which both nations would have waged full-scale nuclear war, obliterating each other's nations, murdering each other's populations, and resulting in "nuclear darkness," which would have resulted in the subsequent deaths by starvation of much of the rest of the world's population. 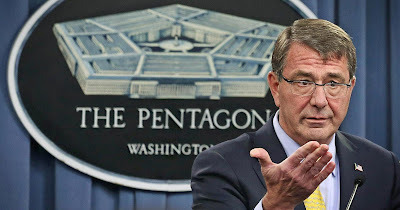 US Defense Secretary Ash Carter has recently been fanning the flames by accusing "Russia of endangering world order, citing its incursions in Ukraine and loose talk about nuclear weapons." 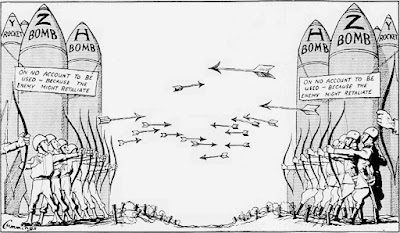 In the article in The Economic Times Carter was also quoted as saying that, "Most disturbing, Moscow's nuclear saber-rattling raises questions about Russian leaders' commitment to strategic stability, their respect for norms against the use of nuclear weapons, and whether they respect the profound caution nuclear-age leaders showed with regard to the brandishing of nuclear weapons." Carter also referred to China in his remarks, but saved the strong stuff for Russia. 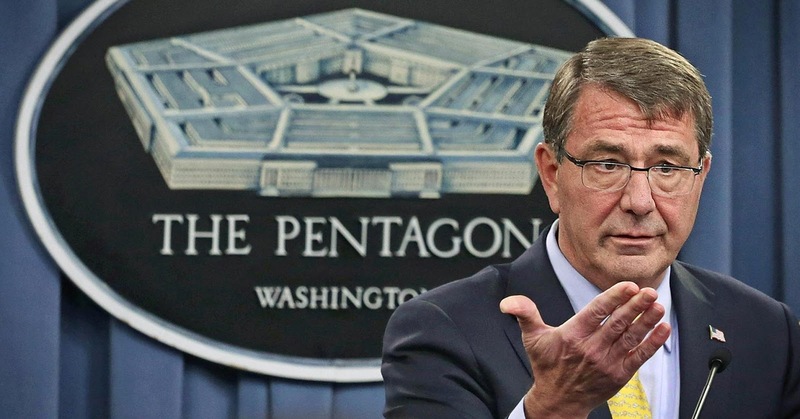 Ash Carter; Lecturing the world, while missing the "plank in our own eye." The Economic Times nailed it with this statement: "The backdrop to Carter's remarks is the reality that after more than two decades of dominating great-power relations, the United States is seeing Russia reassert itself and China expand its military influence beyond its own shores." Therein lies the rub; The Cold War never really ended for the US. We have, ever since the fall of the Wall, had only one purpose - to maintain global hegemony through our military power. I guess the lessons of parenthood have been lost on our nation's "leaders" (and the Military-Industrial Complex that controls them) - we can have influence on others, yet we cannot control them (in the long run at least). And yet we continue to try to exert control through our military, and nuclear weapons are the ultimate form of control by the threat of their use. It is coming back to haunt us. The quest for nuclear weapons, and particularly Trident, has been (as one of my colleagues has called it) a Faustian bargain. Indeed, it is a deal with the Devil, and one where we cannot come out ahead. Scrapping Trident must be at the forefront of any efforts to abolish nuclear weapons, and reducing deployments and taking its weapons off alert status would be a major first step in showing good faith (while not unilaterally giving up anything of substance). Will we, before it is too late, see the folly of our ways, realizing that it is futile to continue trying to maintain an empire the likes of which even the British never could have imagined? Will we come to see the futility of holding on to the fantasy of nuclear deterrence? Will we come to grips with the fact that nuclear weapons offer no security, and will most certainly (as any expert in probability and statistics will gladly explain) lead to either accidental or intentional nuclear war, with horrific consequences to humankind? If only President Obama would find the convictions he left behind in Prague and sit down with President Putin to begin the necessary dialogue to begin the process of ramping back tensions between our two nations and begin the most important process of leading the world toward disarmament. Would that not be the legacy for which future generations would honor him?